The United States experienced a major decline in press freedom over the past year according to the new annual study announced Feb. 11 by Reporters Without Borders. The world's largest press freedom group announced also sharp declines in the rank of the Central African Republic and Guatemala, and "marked improvements" for Ecuador, Bolivia and South Africa. 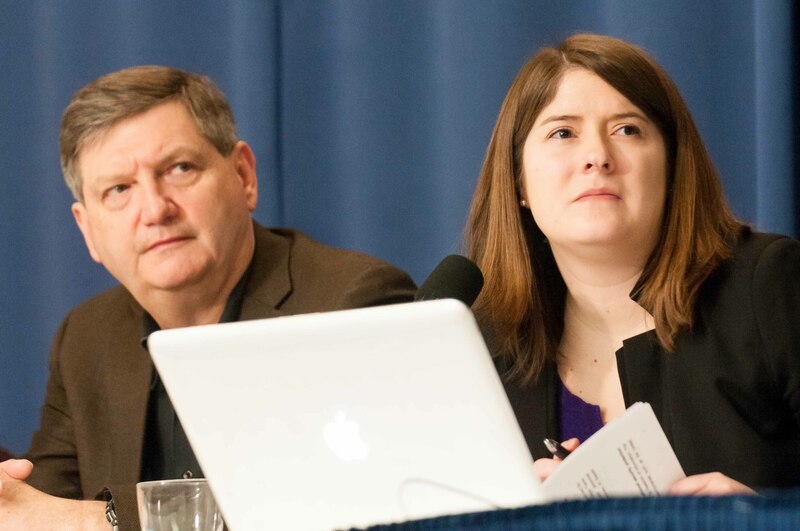 "2013 will go down in history as the worst year for press freedom in the modern history of the United States," said New York Times investigative reporter James Risen on a panel at the National Press Club announcing the results in Washington, DC. Risen said government obstruction and prosecution of whistleblowers have chilled reporting on public affairs in Washington, thereby hurting the public and democratic values. The report cited Obama administration prosecutions of leakers as a major reason for the decline in the ranking of the United States from 32th to 46th. Risen, a Pulitzer-winner and noted author who has fought the threat of jailing for years because he is determined to protect a reputed CIA source, was flanked by Reporters Without Borders United States Director Delphine Halgand and panelist Huong Nguyen in the photo at right by Noel St. John. Nguyen said journalists are suffering a severe crackdown in her native Vietnam as she amplified the report's finding that Vietnam is currently jailing 34 bloggers. Vietnam's government has ordered in "Decree 72" that political news and comment are forbidden on social media and other unapproved electronic communications. Tolga Tanis, Washington correspondent of the Turkish newspaper Hurriyet, spoke also at the panel. He agreed with the report's findings that his native Turkey has become one of the world's leading jailers of journalists. The report found that Syria ranks near the bottom of its rankings of 180 countries according to the seven criteria used. The report said 130 journalists and citizen "news providers" have been killed during Syria's three-year civil war. During Q&A, I asked how the group defines "news providers." Halgand said her group reflects on that difficult question every day and makes its best judgment distinguish between even-handed information providers that her group counts as deserving special protection, and partisan advocates who do not qualify because they are aligned with combatants, in effect. Update: RT International later invited me to comment, Andrew Kreig on RT TV exclusively about Sochi Olympics in an interview by Gayane Chichakyan based on my books and columns analyzing biased media coverage. 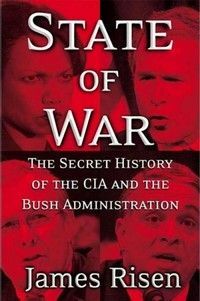 Regarding the United States, the Bush and Obama administrations have threatened Risen jail for protecting his reputed CIA source. The suspect is former analyst Jeffrey Sterling, whom authorities want to imprison on spy charges for talking with a reporter. Risen won the 2006 Pulitzer Prize for national reporting, and was a member of the New York Times reporting team that won the 2002 Pulitzer Prize for explanatory reporting. Also, he wrote State of War, which was instrumental in breaking the story in the Times and elsewhere of massive surveillance of the American people in ways regarded as illegal at the time until Congress retroactively gave immunity to telecom companies. Democratic Presidential nominee Barack Obama opposed retroactive immunity during his 2008 campaign. But he reversed supported the immunity in the summer of 2008 after he secured the nomination and no longer had to compete for Democratic votes. The Congressional vote has the effect of immunizing government officials and preventing the public from learning details of the program via litigation in the vast majority of instances. Last July, an appeals court found that Risen must give evidence at the criminal trial of Sterling, who is being prosecuted for unauthorized leaking of state secrets. Risen and the New York Times requested Supreme Court review last month. The report criticized countries that "interpret national security needs in an overly broad and abusive manner to the detriment of the right to inform and be informed." The report continued, "This trend constitutes a growing threat worldwide and is even endangering freedom of information in countries regarded as democracies." Finland topped the index for the fourth year in a row, closely followed by Netherlands and Norway, like last year. At the bottom, the last three positions were again held by Turkmenistan, North Korea and Eritrea, "three countries where freedom of information is non-existent." The report said, "these countries continue to be news and information black holes and living hells for the journalists who inhabit them." The United States ranked just above Haiti in part because of Obama administration prosecutions under national security rationales. Halgand said three events shaped the reporting climate last year: Edward Snowden’s NSA revelations, the trial of Army Pvt. Bradley/Chelsea Manning for giving classified documents to WikiLeaks, and the Justice Department’s probe of the Associated Press and other media organizations suspected of receiving leaked data. Risen called the Obama team, which took office promising transparency, "the most aggressively anti-press administration in modern American history." Risen said the Obama administration has filed espionage cases against eight former federal workers, more than all previous administrations since the creation of the World War I-era Espionage Act. The previous administration, that of President George W. Bush, filed three such cases. Even beyond spy cases and national security information, government employees have been seeing a climate of fear restrict their options for any type of complaint about government operations, Risen said. They know their communications are being watched and their loyalty assessed, he continued. For reporters and the public, he said, democracy is being undermined when government information is cut off aside from approved news announcements and other officially sanctioned fare. The process is, he said, "rather Orwellian" and has led to widespread self-censorship in the United States media. “The World Press Freedom Index is a reference tool that is based on seven criteria: the level of abuses, the extent of pluralism, media independence, the environment and self-censorship, the legislative framework, transparency and infrastructure,” said Reporters Without Borders secretary-general Christophe Deloire, in a statement accompanying the report, which has been published annually since 2002. US journalists were stunned by the Department of Justice’s seizure of Associated Press phone records without warning in order to identify the source of a CIA leak. It served as a reminder of the urgent need for a “shield law” to protect the confidentiality of journalists’ sources at the federal level. The index’s annual global indicator, which measures the overall level of violations of freedom of information in 180 countries year by year, is available in print for the first time. The index, together with regional and thematic analyses, is available on the free press group's website (rsf.org). The photo at right of the full panel was, like all of those of this event, by Noel St. John, a member of the Press Club. In Iran (173rd, +2), one of the Middle East’s key countries, there has so far been no implementation of the promises to improve freedom of information that the new president, Hassan Rouhani, made. Coverage of the Syrian tragedy in both the official Iranian press and on the blogosphere is closely watched by the regime, which cracks down on any criticism of its foreign policy. Israel’s 17-place rise must be offset against its 20-place fall in the 2013 index as a result of Operation “Pillar of Defence” in November 2012, when two Palestinian journalists were killed, and the many raids it carried out against Palestinian media. Security needs continue to be used as an excuse to limit freedom of information. The Israeli media are able to be outspoken but media located in “Israeli territory” must comply with prior military censorship and gag orders. Investigative reporting involving national security is not welcome. The European Union’s members are becoming more dispersed in the index, a development accelerated by the effects of the economic crisis and outbreaks of populism. Greece (99th, -14) and Hungary (64th, -7) are the most notable examples. In Greece, journalists are often the victims of physical attacks by members of Golden Dawn, the neo-Nazi party that entered parliament in June 2012. The government’s actions have also contributed to the fall. Russia (148th) might have been lower in the index had it not been for the stubbornness and resistance shown by its civil society. But the authorities keep on intensifying the crackdown begun when Vladimir Putin returned to the Kremlin in 2012 and are exporting their model throughout the former Soviet Union. From Ukraine (127th, unchanged) and Azerbaijan (160th, -3) to Central Asia, Russia’s repressive legislation and communications surveillance methods are happily copied. Moscow also uses UN bodies and regional alliances such as the Shanghai Cooperation Organization in its efforts to undermine international standards on freedom of information. Despite its regional aspirations, Turkey (154th) registered no improvement and continues to be one of the world’s biggest prisons for journalists. The Gezi Park revolt highlighted the repressive methods used by the security forces, the increase in self-censorship and the dangers of the prime minister’s populist discourse. In view of the upcoming elections and the unpredictability of the peace process with the Kurdish separatists, 2014 is likely to be a decisive year for the future of civil liberties in Turkey. China (175th, -1) failed to improve its ranking because, despite having an astonishing vital and increasingly militant blogosphere, it continues to censor and jail dissident bloggers and journalists. This new power is also using its economic might to extend its influence over the media in Hong Kong, Macau and Taiwan, compromising their independence. Washington Post, Access denied: Reporters say federal officials, data increasingly off limits, Paul Farhi, March 30, 2015. Obama promised an era of openness, but journalists say it’s the opposite. 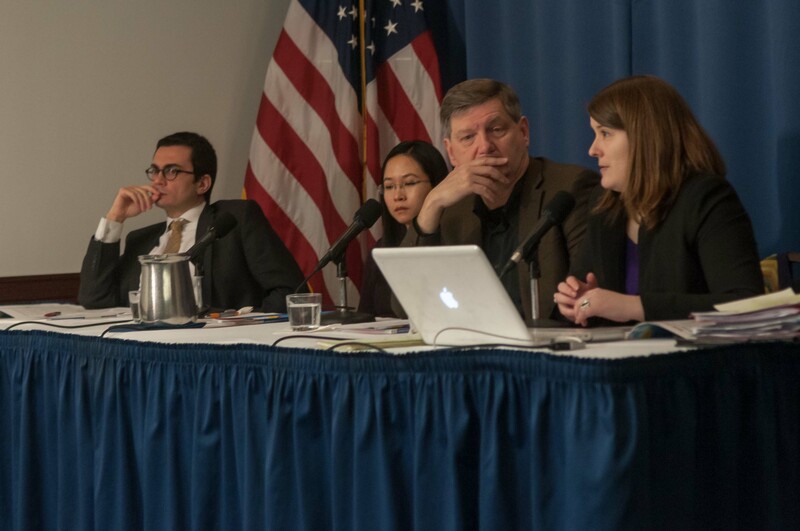 Journalists often encounter closed doors when seeking interviews and data from the Obama administration. Washington Times, Survey: U.S. press freedom plunges under Obama to 46th in world, after Romania, Meghan Drake, Feb. 11, 2014. The Obama administration’s handling of whistleblower Edward Snowden, the National Security Agency leaks and the investigation of a string of leaks produced a plunge in the country’s rating on press freedoms and government openness, according to a global survey released Tuesday. The U.S. under President Obama, who once promised to run the “most transparent” administration in the country’s history, fell from 32nd to 46th in the 2014 World Press Freedom Index, a drop of 13 slots. The index, compiled by the press advocacy group Reporters Without Borders, analyzes 180 countries on criteria such as official abuse, media independence and infrastructure to determine how free journalists are to report. Officials of the group said press freedoms were under attack around the world as governments grow increasingly sophisticated in collecting sensitive data and in tracking down those who leak it. 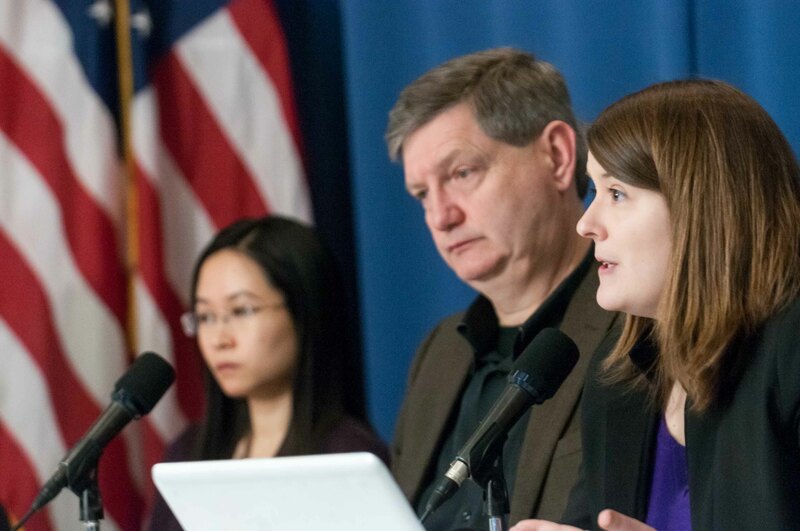 DW, Reporters without Borders: 'Security interests threaten press freedom,' Mirjam Gehrke, Feb. 12, 2014. United States army soldier Bradley Manning was convicted and sentenced to 35 years in prison in the US for violating the country's Espionage Act. Former NSA contractor, Edward Snowden, is convinced if he stands trial in his home country that he will not receive a fair hearing. The subtext is clear: whoever provides journalists with politically sensitive information and classified documents has to factor in a severe punishment should they be caught. Security authorities are increasingly hindering the work of journalists. Even Western democracies are no exception. Reporters without Borders warns that this gives the wrong signal to undemocratic countries. Former NSA contractor, Edward Snowden, is convinced if he stands trial in his home country that he will not receive a fair hearing. The subtext is clear: whoever provides journalists with politically sensitive information and classified documents has to factor in a severe punishment should they be caught. Washington Post, Is US press freedom really 'plummeting'? Not if you look at the data, Max Fisher, Feb. 12, 2014. There are serious and important reasons to worry about press freedom in the United States, particularly in the Obama administration's treatment of whistleblowers, and Reporters Without Borders does important work around the world. But the warnings that the U.S. is "plummeting" are simply not born out in this data, which have been deeply misread and over-interpreted in media coverage. Voice of America, Media Group: Press Freedom Slipping in Some Countries, Pamela Dockins, Feb. 11, 2014. A new Reporters Without Borders index cites hot spots in the Middle East, Africa and Asia as being among the worst offenders of press freedom. The journalism rights group also says there has been a significant decline in press freedom in the United States. Reporters Without Borders says Syria has become an increasingly dangerous place for journalists during the nearly three-year conflict between the government and the opposition. The group's U.S. director, Delphine Halgand, said Syria ranks near the bottom of the index of 180 countries. "You have to keep in mind that more than 130 news providers have been killed in Syria since the start of the conflict in March 2011, including 45 since last year. On top of that, at least 16 foreign reporters and 26 journalism providers are right now detained, kidnapped or missing," she said. Elsewhere, Halgand said a "privatization of violence" is problematic in some African countries. President Obama Toasts President Hollande at the France State Dinner, February 11, 2014, left, and joins the First Lady in welcoming Hollande to the White House, right (White House Photos). Washington Post, D.C. royalty turns out for state dinner, Staff reports, Feb. 11, 2014. The formal White House gathering for French President François Hollande brings actors and D.C. policy types together. Guest List. Washington Post, European body calls for less U.S. influence over Web, Anthony Faiola, Feb. 12, 2014.Stung by spying scandal, European Commission says U.S. should have less power over the Internet. Washington Post, Eric Holder makes case for felons to get voting rights back, Adam Goldman, Feb. 11, 2014. Holder said that current laws forbidding felons from voting make it harder for them to reintegrate. Attorney General Eric H. Holder Jr. on Tuesday called on states to repeal laws that prohibit felons from voting after their release from prison, urging changes that could allow millions more across the country to cast ballots. In a speech at Georgetown University Law Center, Holder said, “It is time to fundamentally reconsider laws that permanently disenfranchise people who are no longer under federal or state supervision.” Holder said that current laws forbidding felons from voting make it harder for them to reintegrate into society. He pointed to a recent study that showed that felons in Florida who were granted the right to vote again had a lower recidivism rate. Washington Post, Foreign regimes use spyware against journalists, even in U.S., The burgeoning surveillance industry is putting potent tools in the hands of intelligence services worldwide, Craig Timberg, Mesay Mekonnen was at his desk, at a news service based in Northern Virginia, when gibberish suddenly exploded across his computer screen one day in December. A sophisticated cyber­attack was underway. A nonprofit research lab has fingered government hackers in Ethiopia as the likely culprits, saying they apparently used commercial spyware, essentially bought off the shelf. This burgeoning industry is making surveillance capabilities that once were the exclusive province of the most elite spy agencies, such as National Security Agency, available to governments worldwide. FireDogLake, Pakistani Drone Victim, Who Has Sought to Hold CIA Accountable, Kidnapped & Disappeared, Kevin Gosztola, Feb. 12, 2014. A drone victim, journalist and activist who has spoken out against drone strikes in Pakistan was kidnapped by 15 to 20 men in the early hours of February 5. He is missing and a judge in Pakistan has ordered the Pakistani intelligence services to produce him by February 20. Kareem Khan has been pushing a legal case against the CIA and Pakistan government, seeking to hold them accountable for the killing of his son and brother in December 2009. He submitted a complaint against former CIA station chief in Pakistan, Jonathan Banks, for his alleged role in the drone attack that left his family dead. Khan alleged that Banks had a “business visa,” which meant he did not have “diplomatic status” and was not immune from prosecution. RT International, In US, headlines write themselves: Cold War imagery resurrected in Sochi bashing, Interview of Andrew Kreig by Gayane Chichakyan, Feb. 13, 2014. 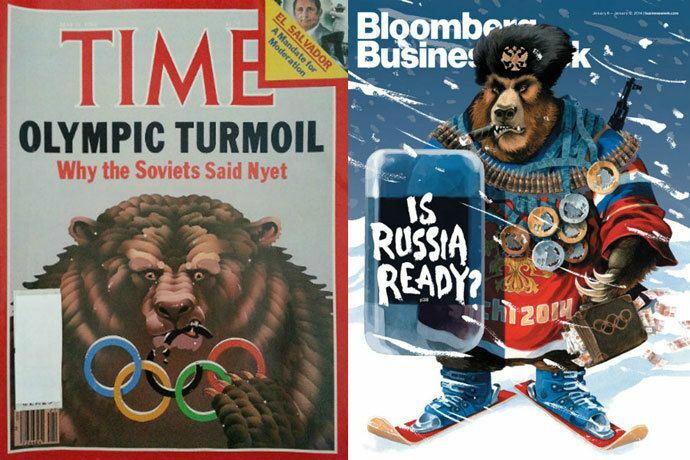 The campaign to boycott the Sochi Olympic Games in the Western media appears to be thriving on almost the same imagery was used three decades ago, at the peak of the Cold War, to project fears of the USSR ahead of the 1980 Moscow Olympics. For months leading up to the biggest sport event of the year widespread calls to boycott the 2014 Sochi Olympics saturated the Western media and social networks. With numerous online and offline boycotts, protests and petitions around the world, it led to a number of world’s leaders not attending the opening ceremony of Sochi Olympic Games.The Sochi 2014 Olympics have become a catalyst for anyone dissatisfied with Russia’s internal or external policies to exercise their wittiness with sharp caricatures, overblowing certain problems to catastrophic proportions. In such a manner, legislation that outlaws propaganda of non-traditional sexual relations to minors has been presented to the international community as a full-scale crackdown on the gay community in a potentially dangerous place for Olympic Games visitors. Andrew Kreig, author of books on news coverage in America, sees nothing surprising in the way foreign correspondents have been desperately seeking persecuted Russian gays. “That’s a classic case that happens all over the place when reporters think they know what the story is and all they are trying to do is to find someone to attach a name and a face to a story that’s almost written in a reporter’s or editor’s head,” Kreig told RT in a video interview. The LGBT theme has become pretty much the only fresh idea in the Olympics-bashing campaign, while most of the others seem to be based on Cold War era stereotypes. Handcuffs, barbed wire and malicious-looking bears have migrated from the magazine covers of 34 years ago to those of 2014 (as indicated at right). FireDogLake, Leaked NSA Memo: Fueling the Perception Snowden Did Not Work Alone & Is No Whistleblower, Kevin Gosztola, Feb. 13, 2014. A number of media organizations have published stories based on a leaked National Security Agency memo that suggests NSA whistleblower Edward Snowden “swiped” the password of a co-worker, a civilian NSA employee, who has been forced to resign for sharing his password. The forced resignation by the civilian NSA employee is being reported as part of disciplining people for allowing breaches of security to happen, not as a part of the NSA’s effort to find people to take the fall for something the agency did not prevent from happening. Washington Post, Mueller rejects idea that Trump is shielded from obstruction laws, Staff report, April 18, 2019. Report suggests investigators found abundant evidence that Trump sought to undermine probe. The special counsel rejected arguments advanced by the president’s lawyers that he is shielded from obstruction of justice laws by his unique constitutional role and powers. Follow along for the latest findings as a team of Post reporters dissects Robert S. Mueller III’s report. President Trump, upon first learning of the appointment of special counsel Robert S. Mueller III, cursed and declared, “this is the end of my presidency,” according to the redacted 400-page report by Mueller released Thursday by the Justice Department. The detailed document depicts a Trump campaign that expected to “benefit electorally” from information stolen and released by Russia and a president who subsequently engaged in several alarming actions, including seeking the ouster of former officials and ordering a memo that would clear his name. The release of the report followed a news conference at which Attorney General William P. Barr exonerated Trump, saying neither he nor his campaign colluded with Russia and that none of Trump’s actions rose to the level of obstruction of justice, despite Mueller leaving that question unanswered in his report. New York Times, Mueller Details Multiple Contacts With Russians and Trump’s Efforts to Thwart Inquiry, Mark Mazzetti, April 18, 2019. Cites Legal Constraints in Declining to Charge, but Does Not Exonerate. Robert S. Mueller III revealed a frantic, monthslong effort by President Trump to thwart the investigation into Russia’s 2016 election interference, cataloging in a report released on Thursday the attempts by Mr. Trump to escape an inquiry that imperiled his presidency from the start. The much-anticipated report laid out how a team of prosecutors working for Mr. Mueller, the special counsel, wrestled with whether the president’s actions added up to an indictable offense of obstruction of justice for a sitting president. They ultimately decided not to charge Mr. Trump, citing numerous legal and factual constraints, but pointedly declined to exonerate him.